We were so focused these last two weeks on the threat of a natural disaster like Hurricane Irene that for most, the memory of last year’s devastating earthquake in Haiti was the last thing on our minds. That is not the case for the Prodigals’ Gregory Grene. On January 12, 2010 the world changed for Grene. His admired and beloved twin brother, Irish/U.S. citizen Andrew Grene, lost his life in the earthquake in Haiti, where he had been working as a senior political affairs officer with the United Nations. In the aftermath of the loss, Gregory and Tim Perutz, the twins’ childhood friend, set up the Andrew Grene Foundation with the aim of helping the Haitian people through education and microfinance. Gregory and Tim returned to Haiti this week, to open the Andrew Grene High School/Collège Andrew Grene in the capital, Port-au-Prince. The opening garnered the front-page headlines in the national newspaper Le Nouvelliste, when Michel Martelly, the president of Haiti, spoke at the opening, and made the Andrew Grene High School the first occasion to put into action his ground-breaking pledge for free education. Martelly promised to underwrite the tuition of every student in Andrew Grene High School for the first two years of the school’s existence. The school was built in partnership with the Digicel Foundation, a Haiti-based organization started by Irish cellphone magnate Denis O’Brien and currently headed by Galway-woman Elizabeth Headon. 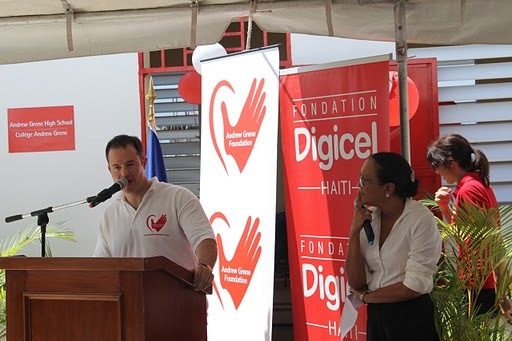 “The relationship with the Digicel Foundation was literally invaluable. We could not have done what we did without them. They actively supervised the construction; they added on additional partnerships with Microsoft and Inveneo for a donated computer lab; they simply know the terrain in a way that no outsider could. Elizabeth and Denis are heroes,” said Gregory. During this same week, the foundation also journeyed to Aquin, in the south of the country, to open the Andrew Grene branch of Fonkoze, the national microcredit/microfinance organization. “There are no real means of coping with a loss like that of my twin brother. The loss is not replaceable, and it’s not something that is measurable or maneuverable in human terms,” says Gregory. If there is a more worthwhile cause than this, I certainly can’t find it. For more information on the Andrew Grene Foundation visit www.andrewgrene.org.